INTRODUCTION: What is RELACT? RELACT stands for the Research, Libraries, and Archives Collections Conservation Task Force, which develops educational resources to improve preservation of paper-based collections throughout the Smithsonian. Most of the resources are also available to allied professionals worldwide. Many have been developed in conjunction with collections based research. Many institutions maintain extensive collections of important and irreplaceable paper-based research records, including documents, photographs, and drawings. Because of continuous use for research, these records are not always stored and managed within a regular archive, but rather by research professionals or collections managers, who often have little or no training in preservation issues. RELACT was begun in 1992 as a pan-Smithsonian collaborative initiative by the Smithsonian's Museum Conservation Institute (formerly the Smithsonian Center for Materials Research and Education; formerly the Conservation Analytical Laboratory) in partnership with the Smithsonian Institution Archives and the Smithsonian Institution Libraries, to educate constituents on preservation issues through diverse activities. Within the institution, collection caretakers provide training grounds and materials for preservation projects, while benefiting from RELACT's contributions of training and other resources. RELACT's homepage, events and calendar of lectures, demonstrations, workshops, and guidelines, provides professionals involved in the use and management of these collections with an understanding and appreciation of the applicable principles and practices of preservation and access. The activities list below describes RELACT's meetings, tours, publications, posters, websites, videos, surveys, treatments, grants, preventive conservation resources center, rehousing projects, and gallery of photographs. To support RELACT's efforts, a SCMRE-based special resource center provides collection managers, trained in RELACT's programs, with the materials and facilities to perform preservation activities such as preparation of rehousing materials and documentation of collections. The center illustrates the integration of activities mandated by national preservation strategic plans, including preservation management, duplication, environmental control, collections maintenance, treatment, research and training. RELACT's programs are open to Smithsonian staff, interns and volunteers, as well as allied professionals and other interested parties. Hundreds of colleagues have participated in RELACT's past programs. 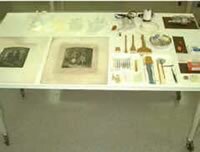 To participate in a future program, contact Dianne van der Reyden, Senior Paper Conservator. Training of Smithsonian staff in preventive collections care, proper handling procedures, collections condition surveys, conservation prioritization, and rehousing materials and procedures for paper-based materials through lectures series and a web-based curriculum. Initiation of phased conservation approaches such as assessment and prioritization surveys, and rehousing projects for selected collections. Provision of access to paper laboratory facilities and some materials for rehousing activities at SCMRE to trained staff. Training of SCMRE conservation fellows and interns within these research collections. Interagency informational exchange with members of the preservation staffs of the Library of Congress, National Archives, and National Park Service. International curriculum development in association with world-class organizations. Special outreach programs serving international constituents and neighbors, including Hispanic archives (HAP Program) and Asian archives (AAP Program). As in all preventive care efforts, activities in the RELACT program are grounded in the custodial obligation for safeguarding the collections for future use, and in the cost efficiency of preventive care when compared to the expense of remedial conservation treatment. Interbureau collaboration and resource sharing generates an optimum impact from minimal resource allocations. BACKGROUND: RELACT is a conservation task force for research, library and archives collections, spearheaded by the Smithsonian Center for Materials Research & Education (SCMRE) in conjunction with the Smithsonian Institution Libraries (SIL) and the Smithsonian Institution Archives (SIA). Since its establishment in FY93, RELACT has coordinated dozens of training and supplemental activities for Smithsonian staff interested in strategic planning for preservation and preventive care of paper-based collections. Through training lectures, symposia, and workshops, RELACT has examined national and international models of strategic planning for preventive care of cultural resources, including some derive from programs designed for natural resources. Cultural resources are as perishable and irreplaceable as natural resources, and models linking the preventive care strategies of cultural and natural resources can be found in two European plans. The first example is the "STEP" Program (Science and Technology for Environmental Protection), initiated by the European Community to fund research protecting the environment, including cultural resources. A second model is the "Delta Plan," initially adopted by the Netherlands to maximize minimum economic resources funding disaster prevention for natural resources, and subsequently adapted to cultural resources. The disaster prevention plan incorporates risk management and emergency responses not only for "loud disasters" such as flooding, but also for "quiet disasters" of persistent decay that inevitably destroy cultural resources if left unchecked. Key to the success of the plan is a pragmatic insistence that museums, libraries and archives expeditiously develop mission statements to justify their collections, and conservation conduct assessment surveys to safeguard them as part of their strategic planning process. SCMRE's Paper Conservation Laboratory has established a resource center for RELACT members and other Smithsonian staff to use. We've organized dozens of lectures on preservation management issues ranging from photo preservation planning, to cost-benefit analysis of storage vs digitization, to appropriate display of materials. We've done numerous demonstrations, like the our recent "Angels Project" collaboration with the Society of American Archivists and the dinosaur collection, where we showed storage and housing options, including display techniques, and digitization for access. We're in the process of organizing a disaster management workshop to supplement our A Primer on Disaster Preparedness, Management, and Response: Paper-Based Materials. We are currently testing scanning on demand in cold storage to cost-effectively halt deterioration before all inherent and informational value is destroyed, by placing items in cold or cool storage rooms immediately, to be scanned when called on first demand. This process allows items to be preserved indefinitely in cold or cool storage, in order to compensate for the fact that digitization, not a permanent medium, captures only an image, not inherent information. We have directly assisted collections by training dozens of students and staff on how to do assessments and surveys; over 57 surveys of tens of thousands of items have been done. We've trained staff and volunteers on how to process collections safely and select cost-beneficial housing techniques; as well as how to make custom-made housing when needed; we've trained staff to write grants for supplies to rehouse 9 collections. We are currently considering some training of staff in collections maintenance procedures to aid access, such as dry cleaning and spot testing as a prelude to humidification and flattening. We've trained over 37 conservation interns in the treatment of over 300 documents, ranging from flattening parchment, to using a suction disk or table to spot treat prints or apply linings, to repairing drawings, photographs, and pamphlets. 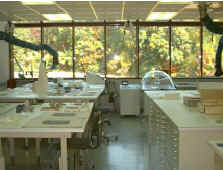 We've undertaken dozens of research studies, to train students, that have resulted in over 33 publications and 51 presentations nationally and internationally on topics ranging from treatment development to characterization of media and of tracing and pigment coated papers (prevalent in archival collections), before and after accelerated aging. Several of these responsibilities are addressed by individual Smithsonian bureaus. For instance, some museums have laboratories responsible for conservation treatment, and the Smithsonian Center for Materials Research & Education (SCMRE) is responsible for conservation research and training of conservators. However, currently there is no coordination of preservation administration, duplication, environmental control, or collections maintenance Smithsonian-wide. Therefore, in conjunction with RELACT, SCMRE has initiated preliminary training efforts in preservation administration, duplication, environmental control and collections maintenance through the RELACT activities from FY93 to 2000, and through the introduction of preservation strategies such as phased conservation. Handling procedures for staff and users (depending on available expertise, such guidelines can be basic or complex, i.e. incorporating information on environment and the nature and deterioration of materials). Appropriate materials and techniques to be used for storage or for exhibition. Framing and packing procedures, etc. Disaster prevention, preparedness, management, and response. Environmental surveys, which can assess, prioritize, and address the preservation needs of a facility, its structure, storage and environmental controls, security, emergency preparedness, etc. to establish or modify handling, exhibition, loan and emergency planning policies. Preservation priority surveys, which can prioritize groups of collections by comparing factors such as their relative value, use, condition, and risk, etc., and recommend options for collections maintenance care, duplication for access to high use collections, and treatment for high risk collections. Random sampling surveys, which can assess and quantify the resource needs of large collections (targeted by prioritization surveys) by, for instance, evaluating the size, condition, housing, and nature of the collection to determine the type, format, quality and quantity of new housing, etc. needed. Item-by-Item surveys, which can assess individual needs of specific items for exhibits or treatment scheduling, etc. Protecting and improving accessibility of collections by preventive care storage or by duplicating or reformatting fragile or damaged items by photocopying, microfilming or making a facsimile, model or replica. Removing and replacing harmful housing or storage techniques (such as acid envelopes), and rehousing with stable materials and techniques to protect collections from handling and the environment. Removing and replacing harmful attachments (such as inappropriate fasteners on paper documents). Supporting and reinforcing damaged collection materials. Fundraising to support resource needs of staff, supplies, equipment, environmental controls, maintenance, treatment, research, and training. Treatment selection and scheduling following a triage protocol. Research characterizing materials, technology, deterioration and care, leading to the development of new treatment, training and administrative protocols. Training in preservation administration, duplication, storage, treatment and research. In order to facilitate these preservation efforts, members of RELACT joined together to successfully seek a grant and other funding opportunities to initiate collections maintenance projects. Many practical collections maintenance procedures involve simple handling and housing practices. Since many older housing materials and techniques are inappropriate and require replacement, supplies must be purchased. Since most bureaus have inadequate budgets for supplies, it was necessary to write a proposal to secure supplies in support of a pan-Smithsonian pilot holdings maintenance initiative in four bureaus was submitted for a Smithsonian Institution Research Resources Grant. However, in addition to supplies to appropriately house some materials, it was necessary to acquire equipment to modify some supplies. This is because appropriate housing requires matching the needs of the collection (i.e. adequate support, protection from handling and light) with stable housing materials and techniques. Appropriate housing materials (paper, polyester) can be commercially purchased, but appropriate housing techniques often must be custom-made in-house. Examples include fitted boxes for damaged bound volumes, neutral wrapper sink mats for brittle mounted photographs, or spot-welded polyester enclosures for separate fragments of documents. This requires special training and equipment. 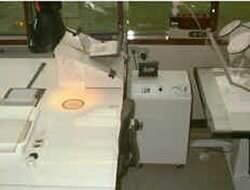 In order to tailor some techniques to the specific needs of some collections, the special equipment required included a heavy duty board shears and board bender for making fitted boxes, and a polyester film welding encapsulator. Funds for such equipment were secured by a proposal to the Smithsonian Institution Archives. In order to assure appropriate storage and distribution of the supplies for four collections selected for this pan-Smithsonian pilot program, SCMRE temporarily allotted a place to be set up as an example of collections maintenance resource center. Supplies for storage of documents, manuscripts, photographs, etc., such as folders and polyester film enclosures L-welded or containing up to 9 pockets, are stored in cabinets designated by examples. Techniques for storing and displaying sensitive items, using for instance wrapper window mats, are illustrated on the walls of the room. In addition, the place houses equipment needed for custom work. It also serves as a training center for staff, interns and volunteers in the use of the equipment and preventive care holdings maintenance procedures. Since many of the bureaus have no personnel available to undertake appropriate preventive care, temporary measures being undertaken include securing grants for contracting personnel, writing proposals to attract conservation interns, or training volunteers. Such personnel can be trained in the theory and practice of assessment surveys and holding maintenance procedures. Conservation interns can be further trained to undertake or develop pilot treatment trials to formulate treatment prototypes that can be used to aid resource management and allotment by providing cost, time and personnel estimates. In some cases, interns can aid in the formulation of research design to develop and evaluate new approaches that can lead to new theories affecting and enhancing preventive care of research collections. d) new conservation treatment prototypes to facilitate resource management and initiate of research designed to develop and evaluate new preventive care approaches, as well as measure the effects of conservation treatments on properties of specific papers, before and after aging (i.e. scientific research and technical studies, undertaken to assess and characterize quantitatively the relative sensitivity and aging properties of specially-made dyed, transparent, or pigment-coated papers used as supports for botanical drawings, architectural tracings, photographs, etc.). "Paper Documents," for Storage of Natural History Collections: A Preventive Conservation Approach. (C.L. Rose, C.A. Hawks, and H.H. Genoways, eds.) Pittsburgh, PA: Society for the Preservation of Natural History Collections, 1995, pp. 327-354. "Disaster Preparedness - Prevention, Response and Recovery Procedures for Water-Based Emergencies: Paper-Based and Magnetic Media Materials," Preprints and postprints of The Symposium on the Conservation and Preservation of Cultural Properties, 1996, pp. 462-498. Guidelines on caring for paper-based materials. Preserving Principles for Paper-Based Collections: Fundamentals and Future Directions in a Digital World curriculum for 6 week SCMRE/ICCROM international course. 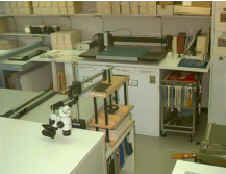 Preventive Conservation Resource Center located at the SCMRE Paper Conservation Laboratory with total $30,000 equipment (such as Ultrasonic Welder, Board Shear, Board bender, and Mat Cutter); supplies (such as different sizes of folders, archival storage boxes, archival quality pockets, as well as polyester film); and different types of storage cabinets. RELACT's preservation efforts aim to respond to the needs of SI's diverse constituents both in the US and abroad. Special efforts have included outreach to the needs of Hispanic communities. This began in 1992 when SCMRE's Senior Paper Conservator Dianne van der Reyden was invited to lecture on preservation in both Spain and Latin America, while at the same time initiating in-house projects including a Getty-funded "Conference on Preventive Care in Latin America" and the publication of a Spanish language disaster primer. The scope of current and future projects has led to the development of a subcategory under the RELACT umbrella of programs, focusing on a Hispanic Archives Preservation Program (HAP) in order to improve coordinated response to a broad category of needs. RELACT's system of on-going short preservation programs parallels many similar efforts gaining support in Latin American libraries, archives, museums, and private collections. One early co-sponsor of these efforts was ICCROM, which for two years invited van der Reyden to teach a two-week course on conservation treatment in Santiago, Chile for conservators from all over Latin America. This was followed by similar programs in Venezuela and Argentina. Curricula for the courses follows closely chapters on preservation and treatment of works on paper which van der Reyden prepared for publication by SPNHC and Butterworth-Heinemann. Theoretical issues include conservation ethics, safety, sampling and condition surveys techniques, and selection criteria for digitization, testing and treatment. Practical training includes cleaning, consolidation, removal of adhesives and stains, deacidification, mending, humidification, flattening, and use of solvents and enzymes. A recent 6-week program co-sponsored by ICCROM and hosted in SCMRE's paper conservation laboratory served an international audience, including conservators from Brazil and the Caribbean. 1999 (Jun 28-Aug.6) "Preservation Principles for Paper-Based Collections: Fundamentals and Future Directions in a Digital World," designed, hosted, co-organized and co-taught six-week ICCROM international course for conservators from 12 countries, SCMRE. 1998 (Aug. 3-14) "Preventive Conservation Strategies for Paper-Based Collections," two-week course for Argentinean conservators, sponsored by the Fundación Antorchas, Buenos Aires, Argentina. 1997 (Nov. 5-15) "Conservation Treatment of Paper Documents," two-week course for professional conservators, for the "Catedra Miguel Arroyo" preservation program, co-sponsored by SI's Voices of Discovery, the USIA, the Museo de Bellas Artes, the Galeria de Arte Nacional, and the Biblioteca Nacional, Caracas, Venezuela. 1996 (Nov. 4-15) "Treatment of Paper Documents," two-week course for professional conservators from Latin America, sponsored by ICCROM and the Centro Nacional de Conservation y Restauracion, in Santiago, Chile. 1994 (Oct. 31-Nov.2) "Treatment of Paper Documents," two-week course for professional conservators from Latin America, sponsored by ICCROM and the Centro Nacional de Conservation y Restauracion, in Santiago, Chile. 1992 (September) "Diagnosticio y Evaluacion della Condicion de Colecciones en Exhibiciones y Depositos de los Museos de Smithsonian Institution" at the National Botanical Gardens, Madrid, Spain, co-sponsored by Head Archives Curator Maria de Dan Pio and Head of Research Maria Higueras from the Naval Museum. RELACT programs have attracted interest in the Far East, where preservation awareness is expanding. For example, in Taiwan, the number of museums has grown rapidly since 1994 and the public has realized the need for preserving cultural property. Consequently several preservation efforts, such as public lectures, symposia and workshops, have been organized in Asia in the last few years. SCMRE's Archives Conservator, Fei-Wen Tsai has been invited to lecture for three of these events, and is currently involved in strategic planning for future efforts. As a result, a subcategory has been formed under RELACT focusing on Asian Archives Preservation Programs (AAP). In 1996, Tsai was invited to present "Preventive Conservation and Preservation Responsibilities" to museum colleagues and the public at the National Palace Museum. On a second occasion, she was invited to speak on disaster preparedness for the Symposium on the Conservation and Preservation of Cultural Properties, Taiwan. The symposium, organized by the Hwa Kang Museum at the Chinese Culture University, was funded by the government to raise public awareness of conservation of historical works of art. A third presentation effort in Taiwan aims to establish the National Conservation Center for the Cultural Properties. In early 1997, a lecture introducing SCMRE and its resources was presented to the Project Review Committee of the National Conservation Center, which is studying organizational structures and equipment used in conservation laboratories in the US. In 1998, Tsai was invited by the Project Planning Office at the National Center for Research and Preservation of Cultural Properties (NCRPCP) to teach a four-day collection survey course (May 6 to 9). The purpose of this project is to collect museum data in Taiwan for strategic preservation planning in the future. During her visit, Tsai was also asked to write an article (in Chinese) about paper preservation. The paper has been submitted for editing to NCRPCP. On July 23, "Seven Areas of Preservation Responsibilities" was presented at the Kaohsiung Museum of Fine Art, Kaohsiung, Taiwan. At the end of November, Tsai was invited by the National Museum of History, Taipei, to teach a three-day paper conservation session (November 28 to 30). The session is part of the Conservation Outreach Program, sponsored by the National Yunlin University of Science and Technology. This is the first conservation training course organized by the university. The university plans to establish a master degree program in conservation for the fall semester, 1999. A final collaboration involves research of Chinese paper. Products of the AAP outreach efforts include publications and handouts in English and Chinese, some of which are being modified for SCMRE's web site.